Laura Davis’ diaries were given to the Oxford Historical Society by a member of the Lum family. According to Town Historian Dorothy DeBissschop, Laura is probably the daughter of John Riggs Davis and Sarah Jenette Wheeler, who was born September 13, 1840 and died January 22, 1928. 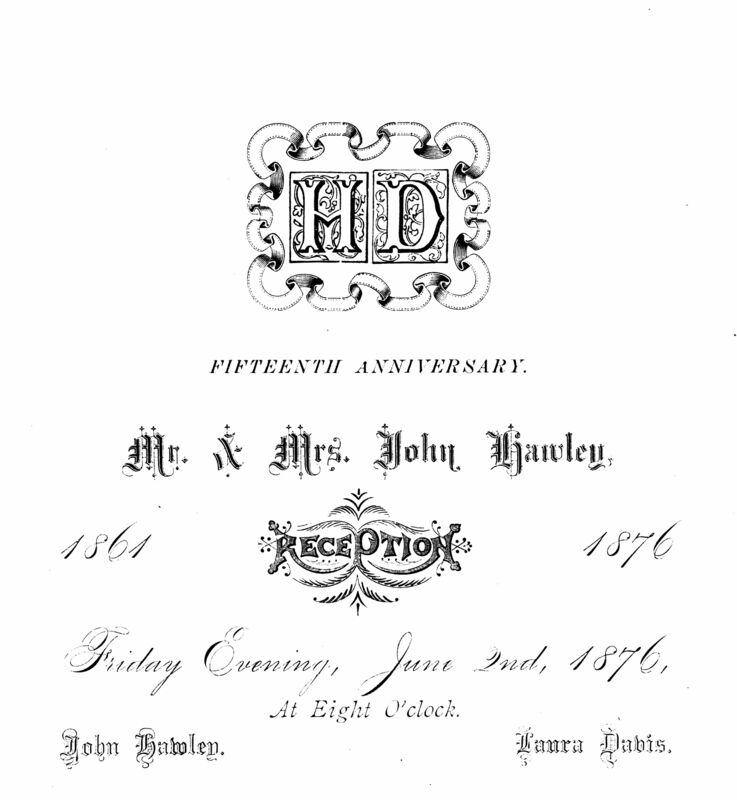 Laura married John Hawley at St. Peter’s Church on June 8, 1861 and they had 1 daughter, Sarah Jennette Hawley. Laura was the great-grandaughter of Colonel John Davis who was captured by the British on Chestnut Tree Hill during the American Revolution. The first diary for the last 2 months of 1856 was glued into the second, for 1857. Both are labeled “No. 1”, so there may have been others that were lost. 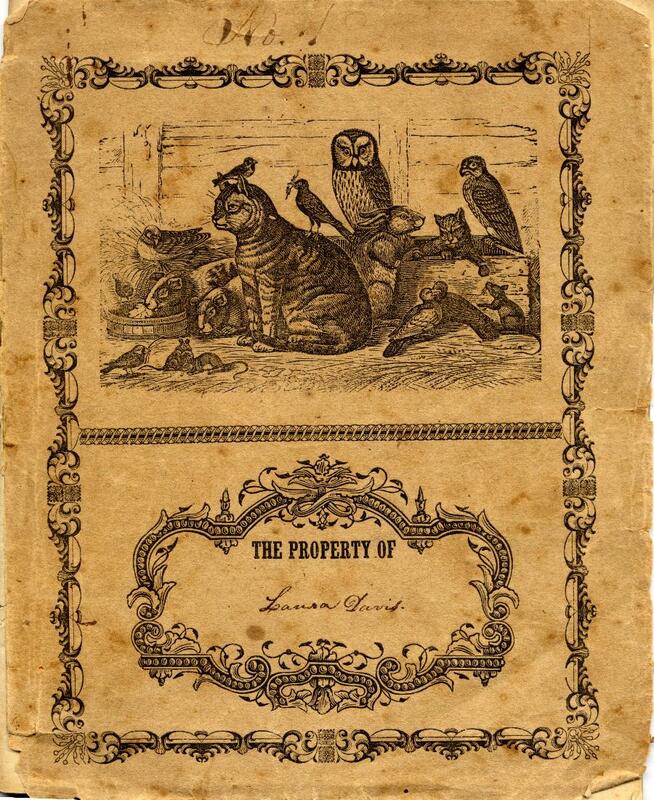 The larger second diary is a school copybook with a fanciful picture of animals on the cover labeled “The Property of Laura Davis”. 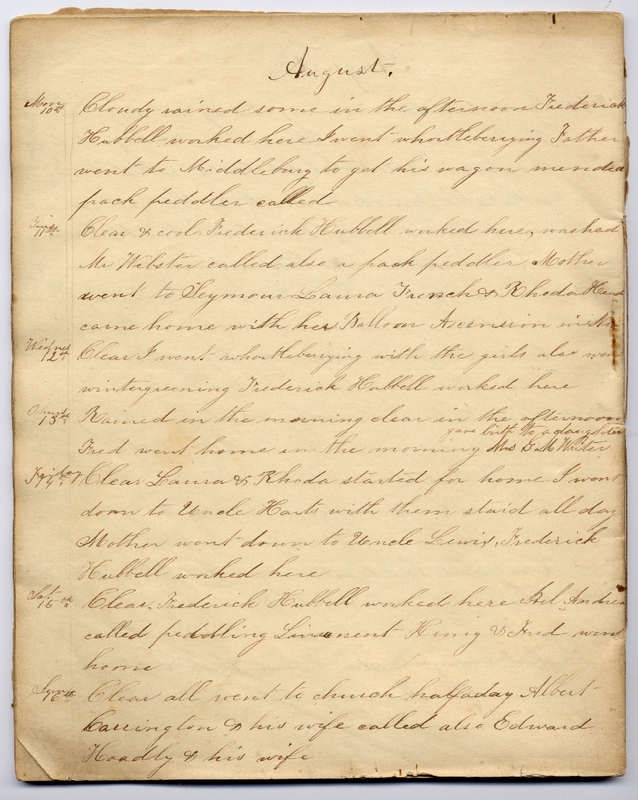 It documents her life through August 16, 1857. Sat 1st Clear & pleasant. Father went to Seymour with a load of wood. Sun 2nd Warm & pleasant. I went to church all day. Charles son of Bennett Scoville died aged 6 months. Father went to Seymour after a coffin for it--also to the funeral. Mon 3rd Cloudy rained in the afternoon. Rev. J. N. Marvin called. Tues 4th Rained some. Father gone all day to Presidential Election. Wednes 5th Clear cold & windy. Mrs. F. A. Candee & Mrs. H. Fair- child called begging for a Festival. Thurs 6th I attended Society at Hanford Fairchilds in the afternoon. Walked over and back. Friday 7th Clear & cold. Father & Mother went to Seymour. Daugh- ter of Cyrus Sanford burned to death. Sat 8th Cloudy rained in the evening. Father went to Seymour. Aunt Martha came up & spent the afternoon. Sun 9th Cloudy all went to church half-a-day. Mrs. Botsford called in the evening, also Uncle Hart. Mon 10th Clear & cold. Father went to Oxford. Mother baked a cake for the Fair. Tues 11th Clear & cold. Father went to Naugatuc (sic). I went to Oxford to help prepare for the Festival. Stayed at Mr. Hudson’s all night. Wednes 12th Clear & pleasant—all went to the Festival. Reached home about 4 in the morning. Thurs 13th Clear & very pleasant, almost dead. Didn’t do much of any thing. Friday 14th Cloudy. Father dug up the drean (drain?). Sat 15th Clear & pleasant. Mother went to Rimmon. Sun 16th Clear & cold. All went to church half-a-day. Uncle Isaac & his wife there. Came home with us. Uncle Reuben & his wife also. Aunt Lucretia came up & spent the evening. Mon 17th Clear & pleasant. Tues 18th Clear & cold. Mother went to mill. Wednes 19th Clear & pleasant. Father went to Seymour with wood. Thurs 20th Thanksgiving. Very pleasant. Alone all day. Father bought two turkeys of Ransom Hine. Friday 21st Clear in the morning, cloudy in the afternoon. Cleaned chambers. Sat. 22nd Rained in the morning. Cleaned house some. Sun 23rd Clear & pleasant in the morning, clouded up before night. Father and I went to church half-a day. Mother most sick. Mon 24th Cloudy. Mother not much better. John Hawley came over to help Father some. I went down to Uncle Hart’s. Tues 25th Father & Mother went to Seymour. Thurs 27th Clear. Mother went to mill. Father worked at Wood House. Friday 28th Clear & warm. I went down to Uncle Lewis. Sat 29th First snow fall. Snowed all day. Father went up to Gidney’s mill after timber. Sun 30th Clear. Horatio Carley’s time expired. James came over & carried him home. All went to church half a day. Mon. 1st Clear & cold. Tues 2nd Cloudy & warm. Wednes 3rd Rained all day. Cleared off. Cold in the evening. Father went to mill. Thurs 4th Cold & windy. John came over. Mr. & Mrs. Carley spent the evening here. Friday, 5th Clear. Libbie Hudson came over. Sat 6th Clear & pleasant. Father & Mother went to Seymour. Libbie went home. Sun 7th Clear & cold. Father & I went to church half-a-day. Uncle Hart & his wife called. Mon 8th Clear & cold. Father & Mother went to New Haven. Tues 9th Clear & very cold. Father helped Mr. Downs butcher. Lyman Johnson buried. Wednes 10th Clear & a little warmer. Father went to Huntington Ladies Fair at Seymour. Thurs 11th Cloudy in the morning. Rained in the afternoon & carried off all the snow. Father went to Seymour. Friday 12th Clear. Rev. J. N. Marvin called. Mother down to Uncle Lewis. Father and I went to Oxford in the evening. Sat 13th Clear & cold. Sun 14th Rained all day. Stayed at home. No one came. Mr. Woodruff preached. Mon. 15th Clear & windy. Worked at cloak. Father & Mother went to Oxford in the evening. I stayed at Uncle Lewis. John Hawley called to see if I would not like to go with him to Dancing School at Quaker Farms. Father would not let me go. Tues. 16th Clear. Bennett Scoville worked here. Father helped Mr. Riggs butcher. Weight of hogs as follows: 480, 440, 440. Wednes. 17th Clear & cold. Father went to mill, also over to Naamon Beck’s (sic). Bennett Scoville worked here. Thurs 18th Clear & cold. Father had his beef butchered. I attended Society at F. A. Candee’s in the evening, stayed at Mr. Hudson’s all night. Orlando Cables died. Friday 19th Clear. Walked home. Henry, son of George De Forest, drowned in Falls Pond, Seymour. Sat 20th Rained all day. Bennett Scoville worked here. Sun 21st Cloudy & cold. All went to Orlando Cables’ funeral. Father went down to Uncle Lewis in the evening. Went to Mr. Riggs. Mon. 22nd Clear & cold. Bennett Scoville worked here. Father went to Naugatuc (sic). Tues 23rd Snowed. Bennett Scoville worked part of a day. Wednes 24th Snow blew dreadfully. Couldn’t go to Christmas Eve. Thurs 25th Christmas day, pleasant. Father helped Tubal butcher Hog, weighed 286. Also salted his own beef. Bennett Scoville worked here. Friday 26th Clear & cold. Father & Mother went to Seymour. Charles & Bennett Scoville worked here. Sat 27th Clear & cold. Charles & Bennett Scoville worked here. Sun 28th Father & I went to church half-a day in a carriage, everyone else in sleighs. Mon 29th Warm & foggy. Butchered. Charles & Ben Scoville helped. Weight as follows: 504, 346, 306, 278. Mrs. Henry Church gave birth to a son. Tues 30th Clear & not very cold. Father went to Seymour & carried chickens, pork, turnips & various other articles. Wednes 31st Cloudy. Charles & Bennett Scoville worked here. Father helped Mr. Seeley butcher hog, weighed 350. Henry son of Mrs. Harison Tomilinson (sic) died. Jan 1st Clear, Father went to mill. Bought a pig of David Candee. Brought him home in the sleigh. Albert Carrington came up, went up to Jobamma Gunn's, also came here with Staples S. Washburn. Emma Hatch, Nettie Botsford, Emma Botsford & Sarah Brown called in the afternoon. Lent my Scrap Book to them. Donation at Rev. S. Topliff’s. Party at Atwater Treat’s. Fri 2nd Clear. Stephen Riggs came here. Mr. Botsford called in the Evening. Father & I went over to Oxford. I went to the Hudson’s. Saw Sarah Topliff. Mother staied (sic) at home Sat 3rd Snowed all day. Salted pork, stuffed sasuages (sic) in the evening. Sun 4th Clear. Snow blew some, Mr. E. Riggs & his son Homer came in the morning. Father went and helped break paths. Emma Hatch came down just at night. Alfred Harger’s child Buried. Tues 6th Very cold and windy. Homer Riggs came in just at night to have Father go and help break paths again. Says it is drifted worse than ever. Father went down to Lewis Davis in the evening. Mark Wooster’s daughter Frances died. Wednes 7th Cold and windy. Mr. Botsford came down to see if we were all frozen to death. Says he has’nt (sic) seen a soul since Monday excepting his own folks. Uncle Hart came up, says the snow is drifted very badly. Thurs 8th Coldest day we have had this winter. Sewing Society met at Enos Chatfield’s. It is said their (sic) did not many attend. Friday 9th Clear, little warmer than it has been. Father and Mr. Botsford shoveled a path from his house to Uncle Lewis, no path any farther excepting through the lots. All went down to Mr. Rigg’s in the evening. Heard they had got the Measles over to Christian Street as thick as hops. Shan’t dare go away again. Sat 10th Warmer, snowed in the afternoon. Father went to Seymour in a sleigh over snowdrifts as high as the fences. Mother made candles. Daniel L. Holbrook buried. Sun 11th Snowed in the morning, clear in the afternoon. Father and I went to church half a day in a sleigh over high snowdrifts. Uncle Hart and his family, Elizabeth Mallett included, came up in the evening, also Uuncle (sic) Lewis and his wife. Mon 12th Clear and cold. Father went to Oxford. Stayed all day. Tues 13th Clear. Nothing of any account happened today. Wednesday 14th Clear. Father and Mother went to Seymour, also up to Uncle Harpin Riggs. Thurs 15th Snowed in the morning, cleared off cold. Father went down to Pritchard’s mill, also over to Oxford. Friday 16th Cold. Commenced going to school to Mr. Northrop. Thomas Johnson came in here in the evening. Traded Almanacs with him. Sat. 17th Cloudy and cold. Father and I went to Seymour. Mother washed. Sun 18th Cloudy and very cold. Snowed in the evening. Stayed at home all day. Mon 19th Cold and very windy. Commenced snowing again in the Evening. Wind blew violently allnight. Tues 20th Clear and not quite as cold as yesterday. Father went to help break paths. Got as far as Enos Chatfields, came home. Got to go again another day and dig over to Oxford. Wednes 21st Clear and quite pleasant, Father went to help break a path over to Oxford. Also went down to Styles Fairchild’s. Mother & I washed. Uncle Hart came up in the evening. Thurs 22nd Very cold and windy. Snow blew violently. Thomas Johnson worked here cutting wood at the door. Friday, 23rd Clear and cold. Nothing of any account happened to day. Mon 26th Cloudy. Father sold his oxen. Brought me down to Uncle Warren’s in the afternoon. Tues 27th Clear. Commenced going to school to Miss Woodruff. Saw Mr. Botsford go past. Wednes 28th Clear. Went to school. Bliss and Mr. Curtiss came up. saw Uncle Hart go past. Thurs 29th Snowed all day. Went to school. Saw Hiram Osborn go Past, also met Edwin Alling. Smith Washburn died, aged just twenty-one years. Friday 30th Clear and warm. Went to school. Saw uncle Buritt go past, also the Treat girls. Sat 31st Snowed in the morning, rained in the afternoon. Smith Washburn buried. Sun 1st Clear and warm. Didn’t go to church, the walking was so bad. Charles Newton’s child buried. Charles Perkins wife died. Mon 2nd Clear. Went to school. Saw John Beecher, also Uncle Lewis and Mary. Mrs. Marvin (?) gave birth to a daughter. Tues 3rd Clear and cold. Went to school. Father and Mother came down. Saw Mr. Leek go past. Wednes 4th Cloudy. Went to school. Saw Uncle Hart go past. Thurs 5th Foggy and warm. Went to school. Charles Perkins’ wife buried. Aunt Thursa and Rhoda came up in the evening. Friday 6th Warm and foggy. Went to school. Went home in the afternoon in a sleigh. Sat 7th Warm and foggy. Elizabeth Mallett came up to make me a Visit. Sun 8th Rained all day. sSomething of a freshet in the rivers. Mrs Judson’s Bridge, Zoar Bridge & Bennetts Bridge all carried away. Mrs. Elias Scott died. Tues 10th Clear in the morning, snowed in the evening. Went to school. Parson Shannon had Donation. All went but me. Fanny Smith came over. Stayed all night. Charles Davis and John French called after Donations. Garry Johnson died. Wednes 11th Clear. Went to school. Saw Uncle Hart go past. Went to Methodist meeting in the evening. Thurs 12th Clear. Went to school. Saw Elizabeth Mallett in the morning. Two funerals that day. Uncle Warren and his wife went up to Mrs. Swift’s in the evening. Sat 14th Clear and warm. Frank Culver came over, spent the afternoon and evening. Uncle Warren went to Naugatuc (sic) on the evening train. Sun 15th Rained in the morning. Went to church all day. Mon 16th Cloudy. Went to school. Uncle Warren came home from Naugatuc (sic). Tues 17th Cloudy. Went to school in the forenoon. No school in afternoon. Aunt Patty came, stayed all day. Mrs. Shannon called in the afternoon. Harpin French came up. Stayed all night. Wednes 18th Cloudy in the morning. Cleared off about noon. Went to school. Harpin went home. Thurs 19th Cloudy. Went to school. Sewing Society at Aunt Thursa’s. Uncle Warren went to Beacon Dam in the evening. Fri 20th Cloudy. Rained in the evening. Father came down. I went home. Sat 21st Clear. Washed. Went down to Uncle Lewis. Sun 22nd Clear. All went to church half a day. Mon 23rd Clear. Father brought me down part way in the morning. Went to school. Aunt Patty here. George Washburn called in the Evening. Tues 24th Clear and warm. Went to school. Walter’s birthday. Wednes 25th Clear and warm. went to school. Saw Grandmother Wheeler. Asa Hawkins broke his leg. Went to Methodist Meeting in the evening. Thurs 26th Clear and windy. Went to school. Saw Father go past. Aunt Polly, Aunt Thursa, Rhoda and Nancy Nichols here in the Evening. Fri 27th Cloudy in the morning, cleared off about noon. Went to school. Mrs. Philo Beecher and Mrs. Aureline Buckingham here in the afternoon. Nelson Weston died. Sat 28th Snowed in the morning, cleared off warm. Bliss came up in the afternoon. Aunt Patty went away. Sun March 1st Cloudy. Went to church all day. Went to Methodist Meeting in the evening. Great many in attendance. Mon 2nd Snowed all day. Didn’t go to school. Bliss went back. Tues 3rd Clear and cold. Went to school. Uncle Warren went to Westville. Wednes 4th Clear. Went to school. Uncle Warren came home. Went to Church after school to a (?) in the evening. James Buchanan inaugurated President of the U. S.
Sat 7th Clear. Washed. Mary and Bernice came up. Father went to Garry Johnson’s auction. Sun 8th Clear. All went to church all day. Mr. Shannon preached. Mon 9th Cloudy in the morning. Mother brought me (unclear). Snowed in the afternoon. Went to school. Tues 10th Clear. Went to school. Prayer Meeting here in the evening. Emma Beach came up. Staied (sic) all night. Wednes 11th Cloudy. Went to school. Went to church after school. Uncle Warren went to New York. Snowed. Smith Wheeler Married. Thurs 12th Clear. Went to school. Rev. Mr. Hill and family came Over, spent the day. Laura and I went up to Mrs. Swift’s in the evening. All the rest went down to Aunt Thursa’s. Saw Homer go past. Sat 14th Snowed in the morning. Cleared off. Father came down. Laura, Rhoda and I went over to Uncle Isaac. Sun 15th Clear. Went to church all day. Went to Methodist Meeting in the evening. Tues 17th Clear. Went to school. Sarah Bunnell came over in the afternoon. Prayer Meeting here in the evening. I went over to Mr. Shannons, was weighed,. Weighed 134. Wednesday, 18th Cloudy. Went to school. Went to Methodist Meeting in the evening. Aunt Lucinda went to Birmingham. Charles Tomlinson’s wife buried. Charles Ransom died. Saw Mr. Hudson. Thurs 19th Rained all day. Went to school. Mrs. Hicock (sic) buried. Died at C. Oatman’s tavern. Sewing Society at Isaac N. Alling’s. Friday 20th Clear and windy. Went to school. Father came down. I went home. Saturday 21st Clear. Washed. Charles Sanford & John Gorden worked here. George Wheeler died. Mary came up. Sun 22nd Clear. Father went to church half a day. Mother and I went down to Uncle Lewis in the evening. Edward Hoadly and Aunt Martha came up. Mon 23rd Cloudy. Father brought me down. Went to school. George Wheeler buried. Tues 24th Clear. Went to school. Rhoda and Nancy came up in the evening. Laura went to Meeting. Mrs. Julius Hotchkiss gave birth to a son. Wednes 25th Clear. went to school. Joseph Gunn called after school. Laura stayed with Emma Beach all night. Thurs 26th Clear. Went to school. Sewing Society at the Hill’s. All went but me. Mrs. DeForest gave birth to a daughter. Raymond French married. Fri 27th Clear. Went to school. Laura went to Class Meeting over to Mr. Roselle’s (?) in the evening. Minott Botsford buried, son of Treat Botsford, aged 21. Sat 28th Cloudy. Aunt Polly & Thursa came up in the afternoon. I went down to see Rhoda. Laura went over to Mr. Culver’s. Staid (sic) in the evening. Father & Mother came down. Sun 29th Clear. Went to church in the forenoon. Went to Methodist Meeting in the afternoon. Went up to Mr. Culver’s to tea. Also went to Meeting in the evening. John Broadwell preached. Mon 30th Clear. Went to school. Fanny Swift and I went down to Rhoda’s in the evening. Quite a large number of people started for the West to day. Tues 31st Clear. Went to school. Laura went to Meeting in the evening. Wednes April 1st Rained. Went to school. Went up to Aunt Ann’s after school. Went to Methodist Meeting in the evening. Emma Beach went forward to the Alter (sic). On our way home we came across Fanny Wheeler and Ann, their Irish girl, walking out. It rained some. Thurs 2nd Clear, cold and windy. Went to school. Sewing Society at Uncle Burritt’s, also one at Uncle Warren’s. Not more than half a dozen here. Fri 3rd Clear and cold. Finished going to school. Father came after me. Sat 4th Clear. Went down to Uncle Lewis. Henry went home. Mrs. Joel Osborn gave birth to a girl. Sun 5th Cloudy. Didn’t go to church. Uncle Hart and his wife came up in the evening. Mon 6th Rained all day. Father went to town meeting. Josiah Nettleton appointed Representative. Tues 7th Clear. Father went to Oxford. Henry went home. Mr. Botsford called in the evening. Marvin Sanford married. Wednes 8th Clear. Washed. William Dyer & a colored gentleman here to dinner. Eli Elvington came and bought what eggs we had. Edwin Alling called. Charles Scovill married (so they say). Abram Carrington married. Thurs 9th Clear. Mr. Sanford and wife called. Henry went to the Ball over to Quaker Farms. Friday 10th Cold & windy. Fast day. I went down to Uncle Lewis in the morning. Father & I went to Oxford in the afternoon. I went to Mr. Hudson’s, Father to Society’s meeting. Nettie Botsford & Katie Hatch came down while we were gone. Joseph Riggs & David came up and got some cherry trees. Rained some in the afternoon. Albert Seeley called in the evening. Mrs. Sidney Davis gave birth to a daughter. Sun 12th Rained all day. Didn’t go to church. Mrs. Leavenworth buried. Bliss French called just at night. Tues 14th Rained very hard all day. Quilted on my star bedquilt. Wed 15th Clear. Mr. Leek came up and got some oats. A stranger called to buy calves. Eli Elvington called and bought some butter. Mary Davis came up, stayed a little while. Mr. Webster from Beacon Falls called. Henry went home in the evening. Quite a snowsquall just at night. Quilted all day. Thurs 16th Clear. Frank Davis came up to borrow the spyglass. Washed. Edwin Alling called. Bought 27 dozen hens eggs. Father started to go to Oxford. Met a man by the name of Canfield coming to look at his oxen. Came back him. Didn’t go atall (sic). Fri 17th Cloudy & cold. Father & Mother went to Seymour. Albert Carrington called as he was going to mill. Tubal came over after some cider. Staied (sic) some time. Father went to Oxford just at night. Sat 18th Clear & cold. Father went to Beacon Falls. Got off the bed quilt. Albert Seely called in the evening. Brought the paper. Sun 19th Cloudy. Rained some. Didn’t go to church. Mother went up to Mr. Botsfords when Father went to fodder. 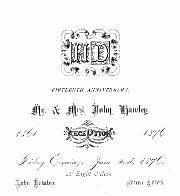 Edward Hoadly married to Aunt Martha Wheeler in the church. Mon 20th Rained very hard all day. Tubal came over after some seed turnips. Henry went down to Pines Bridge, says the water is very high. Father weighed me. I weighed 130. Tues 21st Snowed all day. I went over to Mr. Sanford’s. Wednes 22nd Clear. I went down to Uncle Lewis in the afternoon. Sold a calf to Edwin Alling. Father went to Guntown to mill. Thurs 23rd Clear. Washed & ironed, got on a quilt. Father went down to Pritchard’s mill after plaster, also up to Naugatuc (sic) to carry a cart wheel. Edwin Alling came along. Bought some veal of him. Uncle Hart & Elizabeth Mallett came up after some oats. Mrs. Leman Treat buried. Friday 24th Clear. I went to Oxford. Libbie Hudson came home with me. Called into Uncle Eben’s as we came home. Father sold a pair of oxen to Robert Treat. Henry went and drove them down to him. Staied (sic) all night. Sat 25th Clear. Libbie & I went down to see DeWitt, also went a wintergreening. Our folks planted peas. Eli Carrington called. Sun 26th Clear. Father & I went to church half a day. Edward Hoadly & his wife called. Mon 27th Rained all day. David Candee came over after some oats, took breakfast with us. Uncle Burritt & Aunt Electa came up after some oats. Aunt Electa helped us quilt some. Henry went and carried some potatoes over home. Tues 28th Clear. Washed, baked & ironed. Mr. Webster called. Wednes 29th Clear. Aunt Lucinda & Mary came up to help us quilt. Edwin Alling called. Sold him 4 ½ dozen hen’s eggs. Father went over to Tod White’s, also over to Erastus Wheeler’s to get the horse shoed. Thurs 30th Clear. John Beecher came up to clean some grass seed. Friday, May 1st Cold. Chancey Johnson called to see if Father had any rye to sell, hadn’t any. Father (?) finished sowing oats. Sat 2nd Rained most of the time all day. Father went down the street to look at steers. Trunk peddler staied (sic) to dinner. How much longer he will stay no one knows. Sun 3rd Clear. Father & I went to church half a day. Henry came home with us. Mother staid (sic) at home with the peddler. George Davis came up after tea. Mon 4th Rained some all day. The peddler left, very glad to see him agoing (sic). DeWitt came up to get a box of matches. Cyrus Sanford called to see if we had any pork to sell, didn’t let him have any. Uncle Burritt called to buy some oats. Timothy Cooper called to get a glass of cider. Father went to Naugatuc (sic) after his cart wheel. (Mr Botsford went with him). He also went over to Enos Lum’s. Tues 5th Rained very hard all the forenoon. Cleared off in the afternoon. Uncle Eben called in the morning. Father & Mother went to Seymour. Henry went over to Horace Cable’s to get his boots mended. Didn’t get it done. Wednes 6th Clear. Father watched with Leverett Downs last night. Went to Naugatuc (sic) to mill. Friday 8th Clear. Father & Mother went to New Haven. Edwin Alling called. Sold him three dozen eggs. Tubal called. Made quite a visit. I went over to Mr. Sanford’s to see Delia, she being sick. Sat 9th Clear. Cleaned the chambers. Father went up to see Mr. Downs. Says he isn’t any better. Sun 10th Clear. Father went up to shave Mr. Downs. All went to church half a day. Uncle Hart & family came up after church. I went down to Uncle Lewis. Pierpont Sanford & George Thompson came. I left for home. Mon 11th Clear. Cleaned house all day. Father carted manure to the Canfield land. Henry Upson died aged 17. Tues 12th Clear. Washed. Mother went to Seymour. Trunk peddler called. Enoch Perkins died aged 84. Wednes 13th DeWitt came up after a piece of chalk. I went down to see him also. Frank Davis came up after some mourning clothes for his mother to wear to the funeral. Thurs 14th Cloudy, rained some. Enoch Perkins buried. Father & Mother went to the funeral. Henry Upson buried. Harriet Thomas Married. Friday 15th Cloudy, rained some. Uncle Isaac & his wife came up in the afternoon. Sat 16th Cloudy, rained some. Father & Henry went over to Curtiss Wheeler’s & bought a bull. Henry went home. Sun 17th Rained in the morning, cleared off before noon. Father and I went to church half a day. Quite a thin congregation. Mother and I went down to Grandmother Wheeler’s after supper. George Davis here when we came home. Mon 18th Cloudy & cold for the time of year. Father went down to Albert Carrington’s in the morning. Edwin Alling called. Bought a shad of him. Sold him 7 ½ dozen eggs. DeWitt called. Tues 19th Cloudy, rained in the afternoon. Father went to Middlebury to get the horse shod. Henry went home. Deborah Wheeler died. Wednes 20th Rained all day. Father & Mother went to Seymour. Mrs. Japhet Curtis buried. Thurs 21st Cloudy. Rained some all day. Washed, Mother & I went to Sewing Society over to Hanford Fairchilds. about 26 there to tea. Friday 22nd Clear & warm. Ironed. Commenced making soap. Mrs. Sanford called to buy some flour. Sat 23rd Clear. Made soap & baked some. John Hawley & Antoinette called, also Mrs. Cooper. Father went down to Uncle Warren French’s and bought a calf. Henry went over to Enos Lum’s. Mary Davis came up to bring Mother’s collar home. Sun 24th Clear. All went to church half a day. Uncle Hart & his family came up. Henry & I went over to Mr. Sanford’s to have our fortunes told. David C. Scott died aged 60. Mon 25th Clear. Washed, baked & ironed. David C. Scott buried. Shad peddler called. Tues 26th Clear & warm. Cleaned the milkroom. Mr. Webster called. Let him have two dozen eggs. Mrs. Smith called, also a pack peddler. Wednes 27th Clear. Tin peddler called. Wanted to stay all night, couldn’t keep him. Henry went to Seymour. Thurs 28th Cloudy, rained some. Harry Lum buried. Henry worked for Mr. Downs in the afternoon. Friday 29th Cloudy in the morning, pleasant in the afternoon. Ransom Hine called to get some beans. Uncle Hart called in the evening. Sat 30th Clear, I milked for the first time this year. Sun 31st Rained in the forenoon. All went to church. Came home at noon. Cleared off after we got home. Uncle Hart came up, also George Davis. Father & Mother went down to Uncle Lewis. Mon June 1st Rained some all day. Willis Hollbrook called. Father & Henry went to Seymour with straw. Tues 2nd Cloudy in the morning, clear in the afternoon. Mr. Webster called. Let him have one dozen eggs. Also a trunk peddler by the name of Sage. Wednes 3rd Clear, washed. Father & Henry worked for Uncle Hart all day. Ransom Hine called to get some cider. Shower just at night, also one in the evening. Thurs 4th Clear. Uncle Hart called in the morning. I went down to Uncle Lewis’, also went over to (?) A. Candee’s with Mary to Sewing Society. About 35 there to tea & 50 or more in the evening. Aunt Lucinda came up in the afternoon. Edwin Alling called. Friday, 5th Clear, Henry went over home to work. Father went down to Great Hill to look at oxen. Insurance man called. Sat 6th Clear. Father & Henry went down to Uncle Anson Davis after a pair of oxen. Mother went to Seymour. Mr. Hubbell came over after some pork. Sun 7th Rained some all day. Father & I went to church half a day. Father & Mother went up to the Upper Farm. Mon 8th Clear. Washed. Father went to Naugatuc (sic) to Mill. Mary Davis came up after some peppers. Abel Church died. Tues 9th Rained in the morning. Cloudy all day. I went down to Uncle Lewis in the afternoon. Wednes 10th Rained some all day. Father went to Oxford. Mother went down to Uncle Eben’s in the afternoon. Smith Clark called to buy a calf. DeWitt called while Mother was gone. Thurs 11th Rained quite hard all day. David Smith from Woodbridge called. Bought a calf. Gave ten dollars for him. Friday 12th Clear & windy. A man called to get something to eat. Sat 13th Clear. Shower just at night. Mrs. Fairchild and Mrs. Hudson came over. Father & Henry went up to Mrs. Downs to Raising. I went over to Uncle Lewis after the paper. Sun 14th Clear. All went to church all day. Theodore Swift & Samuel Canfield called. I went up to the Botsford’s. Mon 15th Clear. Father & Mother went to West Haven claming. Tues 16th Cloudy, rained some. Mr. Webster called. Let him have 3 dozen eggs. Silas Tuttle called to see Father. It is reported that today the earth is to be struck by a comet. Nothing of the kind has happened yet. Wednes 17th Cloudy, rained some. Uncle Eben called. Father went over to John Coe’s with a load of bark. Henry planted about 275 hills of corn that the crows had pulled. Thurs 18th Cloudy, rained some. George Davis came up to have Mother part some Dahlias. Mr Botsford called, also a colored gentleman to get some water. Smith Clark came up & got a calf. Mother went down to Uncle Lewis. Henry went home. Truman Towner married to Ellen Brunson. Frank, son of Sheldon Sanford, died aged 9 ½ years. Sewing Society at D. S. Hawley’s. Friday 19th Cloudy, rained more than yesterday. Mr. Hubbell came over after some potatoes. Mother washed. Sat 20th Cloudy in the morning, cleared off about noon. Dried our clothes and ironed. Clouded up at night. Father washed sheep. I went down to Uncle Eben’s. Staied (sic) to tea. Frank Sanford Buried. Sun 21st Clear. All went to church half a day. Charles Stoers’ (?) wife died, aged 26 ½ years. Mon 22nd Cloudy in the morning, shower last night. Cleared off about noon. Father & Mother went to Seymour. Charles Sanford worked here half a day. Charles Stoers (?) wife buried. Mother & I washed. Tues 23rd Clear. Charles Sanford worked here. Aunt Ann and her children came up. Wed 24th Clear. Mr. Webster called. Charles Sanford called. Father sold him two pairs of boots. Henry went home. Staid (sic) all night. Thurs 25th Clear. Mr. Hubbell came over after some pork. Friday 26th Clear. Father went to Waterbury. I went down to Uncle Eben’s after the paper. Sat 27th Clear. Mother went to Seymour & carried Aunt Ann home. Father & Henry went to Oxford to by sythes (sic), also sheared sheep. Sun 28th Clear. Henry went to church. All the rest staid (sic) at home. I was most sick, lay abed most of the day. Howard Moshier’s wife died aged 19. Mon 29th Clear. Washed. Father commenced mowing at the upper Farm. Tues 30th Cloudy. Rained some just at night. An old beggar man called to get something to eat. Eben Wooster called peddleing (sic) all sorts of Yankee Notions. Mr. Webster called. Didn’t trade any with him. Father & I went down to Great Hill to buy pigs. Bought two of Eli Gillett. Paid 10 dollars. Howard Moshier’s wife Buried. Wednes July 1st Cloudy. Rained some in the morning. Very cold for this time of year. Silas Tuttle came down after the George Riggs wagon. Thurs 2nd Cloudy & cold as ever. Rained some just at night. Had the first mess of peas for dinner. Mother went down to Uncle Eben’s in the afternoon. Sewing Society at Elisha Wheeler’s. Not knowing it soon enough, I did not attend. Sat 4th Cloudy in the morning, cleared off before noon. All went to Waterbury to see the Balloon ascension. Saw it go up and it looked very nice indeed. Father & Mother came home. I staid (sic) to see the Fireworks in the evening. They looked very pretty. Sunday School Celebration at Quaker Farms. Sun 5th Clear. I went to Church all day. Went to see the corner stone to the Catholic Church laid after church. There was a great many people there. I have heard the Balloon landed in Cheshire, quite a nice ride I think he must have had. Helen Buckingham, Maria Washburn & John Washburn called in the evening. Mary Lindley & I took a walk upon the Waterville road. Tues 7th Clear. Washed. Mr. Webster called. Father got in his hay that he mowed a week ago yesterday. Henry Tomlinson married to Mary A. Buckingham. Wednes 8th Clear. Mr. Hubbell worked here. Father went to Seymour in the morning to have a tooth drawn. I went up to Mr. Seely’s in the afternoon to have Chary fit me a waist lining. Uncle Hart’s wife & baby came up & spent the afternoon while he was gone to Naugatuc (sic) . Thurs 9th Clear. Charles Sanford worked here. Mother went to Seymour. Friday 10th Clear. Charles Sanford worked here. Sat 11th Clear & warm. Charles Sanford worked here. Henry went Home. Sun 12th Clear & very warm. All staid (sic) at home. Mary Davis called, also Edward Hoadley & his wife. Maria D (?) buried at Pines Bridge. Mon 13th Clear. Shower in the afternoon. Washed. Tues 14th Cloudy in the morning, cleared off about noon. Mr. Webster called. Didn’t trade any with him. Father & Mother went to Birmingham. Wednes 15th Cloudy in the morning, cleared off. Tin peddler called. I went down to Uncle Lewis just at night. Mrs. Nehimiah Andrey gave birth to a son. Thurs 16th Clear. I went up to Mr. Seeley’s in the morning to get him to come & help Father get hay. Couldn’t come. Sewing Society at Harry Sutton’s. I did not attend. Friday 17th Clear. Washed. Mother went down to Uncle Eben’s in the morning. Henry went to Oxford. Sat 18th Cloudy most of the day. I went down to Uncle Lewis. Mr. Hubbell called to get some potatoes. Sun 19th Clear. Father and I went to Church half a day. Edwin Alling’s wife baptized. Church at 5 o’clock for the Baptism of infants. Mr. Dunham’s store occupied by Mr. Hindsley burnt last night. William Twichel’s (sic) wife buried. Mon 20th Cloudy in the morning, cleared off before noon. Thunder-storm last night. Washed. Father went to Mill in the morning. Broke his wagon . Went up at night and got his grist and his wagon. Tues 21st Clear. Thunder shower last night, also one this morning. Father commenced cradleing (sic) rye. Mother went down to Uncle Lewis’. Aunt Lucinda gone so she went over to Uncle Eben’s. Wednes 22nd Clear. Father cradled rye at Upper Farm. Mother went down to Uncle Eben’s in the morning. Mr. Webster called, also Ransom Hine. Thurs 23rd Rained very hard all day. Father went to Oxford. Henry went home, staied (sic) all day. Friday 24th Cloudy. Henry came back, but went away again. Father cradled rye at Upper Farm. Sat 25th Cloudy. Henry came back but went away again. Tubal Sanford worked here all day, also Charles Sandford half a day. Mother and I went to Seymour. Sun 26th Clear. Didn’t any of us go to church. Henry came back. He & Father raked rye & got in hay. George Davis called. Mon 27th Cloudy in the morning, cleared off before noon. Father finished cradleing (sic) rye. Mrs. W. Gidney gave birth to a son. Tues 28th Cloudy in the morning, cleared off before noon. Shower in the evening. Mr. Webster called, also a pack peddler. Didn’t trade with either. Washed. Wednes 29th Cloudy in the morning, cleared off about noon. Henry went home at night. Thurs 30th Cloudy in the morning, rained in the afternoon. Henry came back. His brother Frederick came with him. Father sowed turnips. DeWitt came up to grind some razors on our grindstone. Fri 31st. Cloudy. Frederick Hubbell worked here. I went down to Uncle Lewis’s. Father went to Oxford. Sat August 1st Cloudy in the morning, cleared off about noon. Frederick Hubbell worked here. I went down to Uncle Lewis after the papers. Shower in the evening. Sun 2nd Clear. Mother and I went to church half a day. Charles Hubbell called in the evening, also Bliss French, Rhoda Kendall & Hannah Shannon. Mrs. Enoch Perkins died aged 79 years. Mon 3rd Clear. Washed. Frederick Hubbell worked here. Father carted rye from the Upper Farm. Mary Davis & Frank came up in the evening. Tues 4th Clear. Frederick Hubbell worked here. Father finished carting rye, commenced cradleing (sic)oats. Mr. Webster called. Didn’t trade any with him. Mrs. Enoch Perkins buried. Wednes 5th Rained in the morning, cloudy all day. Frederick Hubbell worked here. Henry went to Oxford to get his shoe mended. Joel Chatfield called to buy cattle, also Daniel Wooster to buy the Bull. A man staied (sic) here all night that was peddleing (sic) maps. What his name was, I do not know. Thurs 6th Clear, shower in the afternoon. Frederick Hubbell worked here, went home at night. I went over to Mr. Hudson’s. Staid (sic) all day. Father came after me at night. Friday 7th Clear. Frederick Hubbell worked here. Had green corn for dinner for the first time this year. Trunk peddler called. Sat 8th Clear, but not a very good hay day. Father got in oats. Frederick Hubbell worked here. I went to the Chatfield land after cows. George Davis birthday. Sun 9th Clear. Mother and I went to church half a day. Quite a good many there. Parson Marvin gave them a lecture about working Sunday. I went down to Uncle Lewis after supper. Mary was gone away. George Davis called. Mon 10th Cloudy. Rained some in the afternoon. Frederick Hubbell worked here. I went whortleberrying. Father went to Middlebury to get his wagon mended. Pack peddler called. Tues 11th Clear & cool. Frederick Hubbell worked here. Washed. Mr. Webster called, also a pack peddler. Mother went to Seymour. Laura French & Rhoda Kendall came home with her. Balloon Ascension in New Haven. Wednes 12th Clear. I went whortleberrying with the girls, also winter- greening. Frederick Hubbell worked here. Thurs 13th Rained in the morning, clear in the afternoon. Fred went home in the morning. Mrs. G. M. Writer gave birth to a daughter. Friday 14th Clear. Laura & Rhoda started for home. I went down to Uncle Hart’s with them. Staid (sic) all day. Mother went down to Uncle Lewis. Frederick Hubbell worked here. Sat 15th Clear. Frederick Hubbell worked here. Joel Andrews called peddling Lineament. Henry & Fred went home. Sun 16th Clear. All went to church half a day. Albert Carrington & his wife called, also Edward Hoadly & his wife.